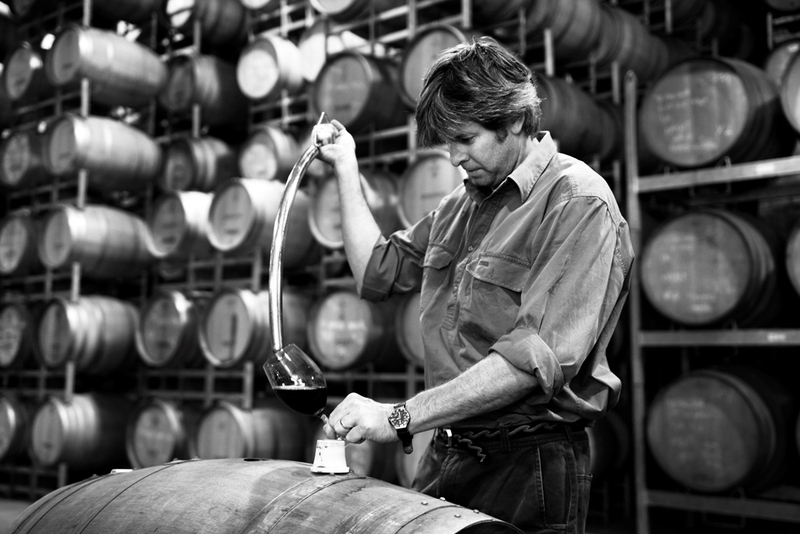 ​CURIOUS ABOUT WHAT HAPPENS BEHIND THE SCENES IN OUR WINERIES? FOR A SNEAK PEEK YOU CAN'T BEAT A WINERY TOUR. If you've got wine on your mind and want to know more than just what each variety tastes like, you'd best book yourself a Hunter Valley winery tour. Learning how our world-class wines came to be will give you a deeper appreciation of what it takes to be able to squeeze a bunch of beautiful grapes into a delicious bottle of vino. Not all wineries run scheduled tours, but here are some that do. Make sure you wear comfortable, enclosed shoes and slap on a bit of sunscreen, because you will more than likely be taking a leisurely stroll through the vineyards where the grapes for our great wines are grown. This very special tour will have you stepping back in time, to 1858 to be exact, when founder Edward Tyrrell built a slab hut (which still stands today) and planted grapevines on a hillside with sweeping views of Wine Country. The tour starts right underneath the Brokenback Range, next to one of the oldest vineyards in the Hunter Valley, and moves through into the old winery where you can see first-hand how some of Tyrrell's best wines are made. Then, follow the dirt floor to the old cellar door to taste a few of Tyrrell's delicious drops, like their outstanding Hunter Valley Chardonnays and Shiraz. The hour-long tours run every day from 10.30am and cost $5 per person. There is no need to book, just be on time. For a winery tour that's as fun as it is educational, head west to boutique cellar door Whispering Brook, in Broke. Tours run from 10.30am Friday to Sunday, beginning in the cellar door before taking in a short walk past the vineyard with the magnificent Yellow Rock peeking up over the crest at the end of the vine rows. You'll then head down into the olive orchard where rackety king parrots and cockatoos compete with cellar door manager Ron Corino, who explains how the wines are made. Back inside, just past the cellar door, the tour culminates with a wine tasting, including the Portuguese-inspired Touriga Nacional Shiraz blend, which happens right next to the barrels and tanks of the working winery. Tours are $10 per person. Vinden Estate's winery tour gives a great insight into how a bottle of wine comes into being. Tours run on weekends, starting at 10am each day, and are usually hosted by the family winemaker Angus Vinden, often accompanied by his trusty sidekick Eadie, his German shorthaired pointer. Angus has big plans for Vinden Estate, which he'll tell you a bit about on one of the hour-long tours through the estate, where new Italian Aglianico vines have been planted and some compelling Hunter Valley wines are being made. Make sure you taste the Vinden Estate Rosé, or one of Angus' own, very special, 'Headcase' wines. Tours are free, but book ahead to ensure your spot. "Winery tours are a great way to find out more about what's in your glass," says McGuigan's cellar door manager, Gavin Roberts. "People get a kick out of seeing how our wines are made and where they come from." McGuigan has won too many awards and trophies to list here (they've won International Winemaker of the Year a record four times!) and you can easily see why on their tour. Walk through their fully functioning winery on McDonalds Road where up to 1000 tonnes of grapes get crushed, fermented and transformed into wine each year. Tours run at noon, seven days a week, with an additional tour at 11am on weekends. Tours cost $5 per person. Nestled among the slopes of the Brokenback Range, Tallavera Grove hosts scheduled vineyard tours every Saturday and Sunday from 10.30am. The tour takes in one of the prettiest views in all of Wine Country. Starting in the cellar door, a brief explanation of the Mount View soils prepares you for a walk through the beautiful verdant vine rows that gently slope down along the contours of the range. Intrepid winos are taken down into the vineyard and shown how the vines grow, before heading back to the cellar door to taste a selection of wines made from the same vines you have just walked amongst. The Semillon and Shiraz are, of course, outstanding, but so too is the weird and wonderful Rogue series 'Shagadelic' Shagrantino – a red blend of Shiraz and Sagrantino. Bookings are essential. Tours are $12 per person and include souviner Govina tasting glass. Down on the corner of Hermitage Road and Mistletoe Lane, a full-on immersive wine experience awaits you at Hermitage Road Cellars and the Hunter Valley Wine School. Get the complete experience by booking a spot on the five-hour vino adventure, which includes a walking tour of the on-site vineyard planted with 50-year-old Shiraz vines, followed by a picture-perfect ride in a horse-drawn carriage, before sitting down to a fun and informal wine tutorial and tasting experience with lunch at the end. Tours are $230 per person and include a personalised Hunter Valley Wine School Certificate to certify your grape adventure in Wine Country.